Spring Trends with Max Studio's $1000 Online Shopping Spree! Are you ready for some spring fashion and spring shopping? 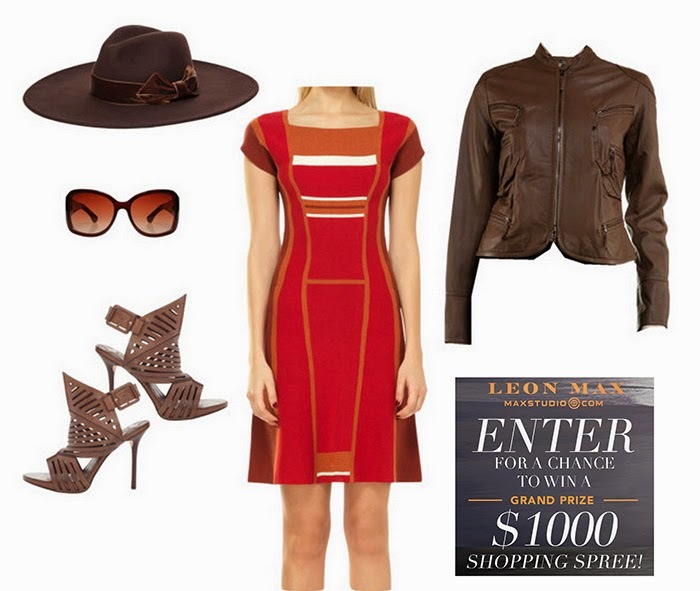 Leon Max is helping you out with a $1000 gift card giveaway to nab the latest spring trends for your closet. I have been a longtime fan of Max Studio’s Euro-chic style and fashion forward fabrications. Inspired by 2015’s Color of the Year Marsala, I have already picked out some of the spring and summer Max Studio pieces I will be buying if I win this contest. I love all the spice colors of the cotton rayon cap sleeve sweater dress. The leather moto jacket has a feminine update and great for layering on top of dresses in cooler weather. I love a bohemian hat and paparazzi-repelling sunglasses. Those slashed leather stilettos? How HOT are those? Of course, I am not the only shopper of Leon Max’s fashion collection. Zooey Deschanel and Olivia Wilde also count themselves as fans. I particularly love the body hugging knits and beaded details on the evening pieces. The Hollywood set I’m sure is lounging around in their floating maxi dresses. The jet-setting look of the Max Studio fashion collection is so comprehensive because their design team spans Los Angeles, New York, and London. If you look closely at the styles, you can almost pick out exactly where each look was designed. I also like their collections because I find that the styles are really well priced for the quality and construction of each style. I don’t always splurge, but I have Max Studio dresses from fifteen years ago that I still love. Whether you are shopping on your own or letting Leon Max treat you, stay up to date on the latest new on the brand from the Max Studio Facebook page. Don’t forget to enter their $1000 gift card giveaway right on their site! You just need to enter your e-mail before Friday, March 27th, 2015. Presented by Leon Max and Max Studio. Just entered! Drooling over your picks! Thanks for the giveaway. The shades and shoes are bad! Nice gear. Maybe I'll enter and win for my wife. LOL. Love the lines of that dress! I'm not a huge hat person, but that hat is CUTE! Love the whole get up!